Need double the room to serve double the great hot beverages to your guests or customers? Try our double size 20 oz Double Wall Paper Cup. Its dual wall construction locks in the beverage’s heat. 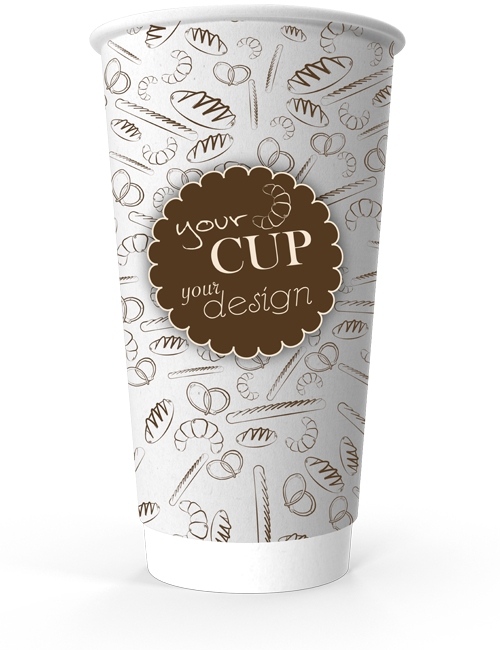 Place your logo or marketing message on your designer paper cup and start building your brand. We make it easy to customise your cup to become an avenue for advertising. Our Double Wall Cups are carefully constructed with two separate layers of cardboard and an isolating air gap in between. This protects the cup’s user from even the hottest beverage and eliminates the need for sleeves. These custom printed paper cups are perfect for any event, festival, exhibition, or conference, as well as in cafes, restaurants, businesses, and shops. The 20 oz Double Wall Paper Cup’s inner wall is made of a very rigid 310 gm top-notch boxboard and its outer wall is made of an equally unyielding 300 gm high-quality boxboard. Truly supreme stability! Your individual design will be printed with full colour or process inks that are 100% food safe and odourless. Thanks to our maximum resolution printing, the images on the paper cup will appear flawless and totally enhance your brand image. Contact our design team for perfectly printed paper cups. Ask about our special design effects that can really make your product and brand one-of-a-kind. Whatever the size of your business, CupPrint is your flexible partner. We can cover small runs from 1,000 units up to large runs of 250,000 units at extremely economic pricing. Regardless of quantity, your order will be processed immediately and your Double Wall Cups will be delivered to you within 14 working days! For your individual Double Wall Cup 20 oz design we provide you here our rectangular template as PDF for download.